I'm a bit confused. If the MSD box is NOT being used, why can't you simply hook it up like this and be done with it? What am I missing? Roger - In your top drawing from MSD, the assumption is a full 12 volts. 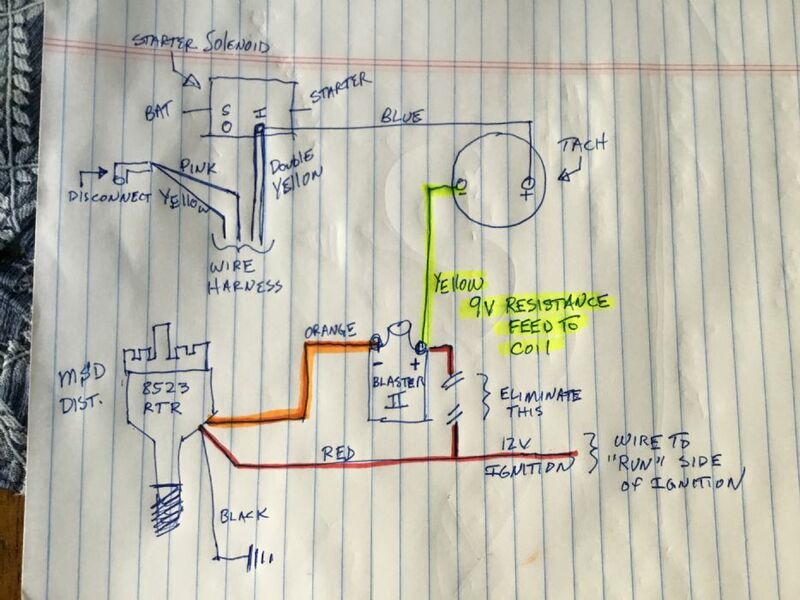 But the tach can’t handle the full 12v, or if you assume in the same drawing the voltage is 9.6v from the key to the tach to the coil, the power feed from the coil to the dist is insufficient for it to operate nominally. The dist needs a full 12v. The tach needs 9.6v as does the charging system to operate properly. Are you sure that the tach won't withstand 12 VDC to ground? Think about this for a second. What do you think the voltage is at the coil + terminal with the key on, the points open, and the engine not running? I would bet that it is at full battery voltage. So what is the voltage at the tach to ground? Full battery voltage. As the AMC tach that is being discussed is a series tach that operates from current pulses, not voltage, I am struggling with the concept that it couldn't be wired as I've shown and work. I would also comment that the charging system (assuming this is a '69/'70 vehicle) does NOT need the 9.6 volts for proper operation as the regulator voltage sensing terminal is between the alternator output and the isolation diode(s). 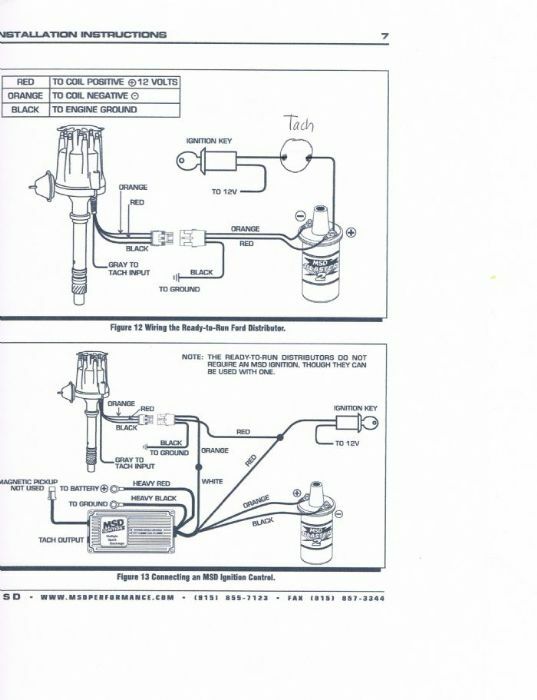 The tie to the ignition system is for startup regulator supply only. Full disclaimer: I've worked a bit with Ford tachs that are similar to the AMC tachs but not with an AMC tach in particular. Are you sure that the tach won't withstand 12 VDC to ground? No, I’m not sure, didn’t have an extra tach to sacrifice. What I do know is the voltage to the tach is ~9.6v. The pink resistance wire provides this reduced voltage from the ignition . What do you think the voltage is at the coil + terminal with the key on, the points open, and the engine not running? ~9.6v. The pink resistance wire, which connected to the yellow wire at the solenoid. This yellow wire feed power to the I terminal on the solenoid. The blue wire connected to the same terminal feeds power to the tach and on to the coil + side. Greg, I fully understand and appreciate your caution in moving forward with your project. It's hard enough to get 50 year old parts without destroying them due to carelessness or poor choices. That being said, I think that if you configure your car as I outlined, key on, engine off, points open (or - side of the coil disconnected if you do not have your points distributor) and measure the voltage at the coil + terminal, it will be full battery voltage. If there is no current through the resistance wire (points open) there will be no voltage drop. In the end it may be better to have your tach converted and driven from the tach output on the MSD distributor. Good luck. As to the charging circuit, I stand by my original statement. I took a couple of pictures this morning, probably won't help anyone a lot, but know that the White70JavelinSST is wired like this. 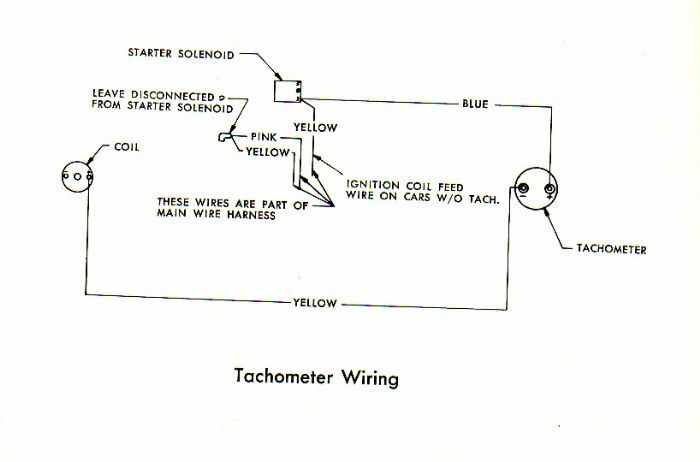 Yellow wire from 70 Javelin factory in dash tachometer to positive side of coil. Disconnected the yellow and pink (or on this car it looks tan/light brown but could be color faded) wire from the solenoid, (not used). The distributor wire connector is ty-wrapped to the oil fill tube. There is no gray wire on this MSD RTR Billet Distributor. The underhood has never been restored on this 50 yr old car. The engine has never been out so please forgive the appearance. The tach works fine. It has worked fine for probably ten years wired this way. The two yellow wires wrapped in the factory thermal cover and just to the front of the voltage regultaor go to the starter side post of the solenoid. The black ground wire from the distributor is grounded to the horn relay mount (wire is seen just above the large red cable to the amplifier and between the two SS braided AC lines). The disconnected yellow and tan wire with a blue piece of tape around it can be seen in front of the voltage regulator and a bit below it. I do not have a MSD ignition box installed nor is there some other type of tachometer adapter being used. It's just the MSD 8523 RTR Billet Pro-Distributor, Blaster 2 coil and factory AMC 8k tachometer. To solve the issue of can't shut car off go to this link (MSD Tech Support) and click the Engine Run On tab. Follow directions, it worked for me. I have the factory tach as well as an Autometer tach and both are operational with the RTR distributor. Roger - agree, good discussion. With my ‘70 AMX, I wanted to stay with the original wiring and electrical system schematics. 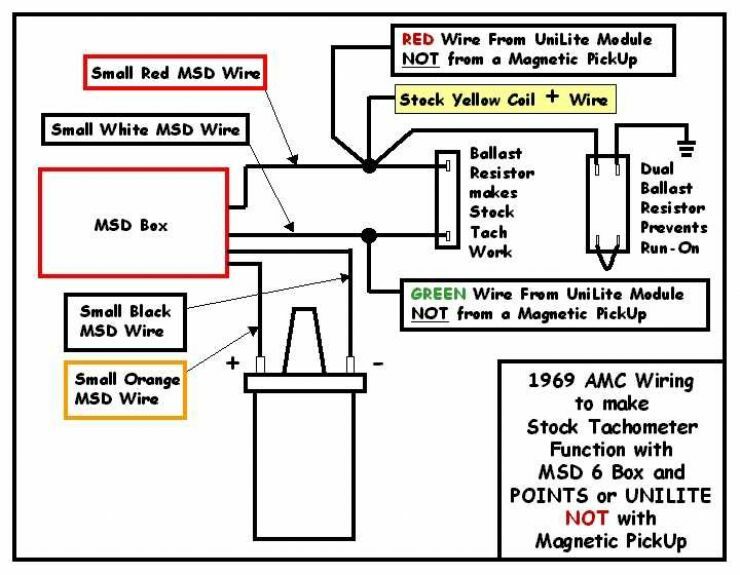 I initially used Armand’s (White70) wiring diagram for my MSD 8523 dist. because of common wiring - it didn’t work, hard starting, popping, shuddering, etc. I believe this due to Armond’s dist being 10years older, no grey wire for tach wave signal, which my dist has. I believe this is why other current 8523 dist owners are experiencing hard start/run issues. By adding a discreet 12v line to the dist tied into the ignition wire before the pink resistance wire, I accomplished the best of both old and new: modern 12v dist, integrated into the original ‘70 wiring, no tach upgrade expense. I purchased a second MSD 8523 about four years ago for use in a fresh build 70 390. I just opened the box to verify. It has the grey wire, so I'll be using Someassemblyrqd's wiring method probably. What I find interesting is the popping and sputtering some one posted about earlier. That almost sounds like a way out of time setting problem. Like 180 degrees out of time. Armand - I’d like to hear from you on your engine start/run results by you plugging in the new rtr dist in your Javelin with its current wiring. Would like to see if you different results (runs smooth, no popping/shuddering) or the same as I experienced thus you needing to follow my wiring. Holy bajesus, it worked!! Someassemblyrqd, thank you so much for the drawing. And then dumbing down the directions so that I could understand it. I really appreciate it, let me know where to send the check. The car starts and shuts off, and the tach works. I tried to spiffy up the wires a bit. Now, only 2 more problems(maybe 3) I didn't know if I should ad on to this thread, or start a new one. So I'll start a new one, it will be titled, ALT Light Still On. Help me if you can. Thanks again. I'll try to keep that in mind. This is one of those projects that drags on and on cuz so much other stuff gets in the way. Right now the problem is, it's way too cold in my shop. Anyway the plan is to break in the cam on an engine run stand. So I'll wire it pretty simple, just to start and run. I may try to borrow a suitable tachometer if I can. But I'll try to keep you updated.